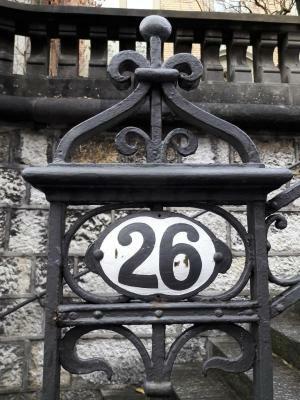 Lock in a great price for B&B Gutenberg – rated 9.3 by recent guests! The room was very spacious and clean. The cleanliness is top notch. Toilets and bathrooms very clean. And Angela and the husband are very nice and friendly people. I would recommend the place to anyone who wants value for money. Lucas and his brother Patrick are FANTASTIC! Lucas helped me with directions over the phone and on the property upon arrival in Bern, and Patrick served a delicious, comfortable breakfast the next morning. 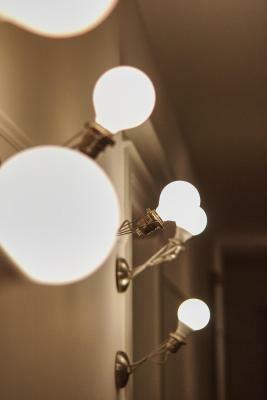 The room was huge, clean and restful; the roomy balcony overlooking the quaint neighborhood street was a treat; and the B&B was within quick walking distance of public transportation, for which our stay included passes. I can't say enough good things about this property and its staff! The hosts were wonderfully hospitable and accommodating with letting us check in late and leave our luggage there past check out. Breakfast was great and everything was very clean. Easy walking distance from the train station. 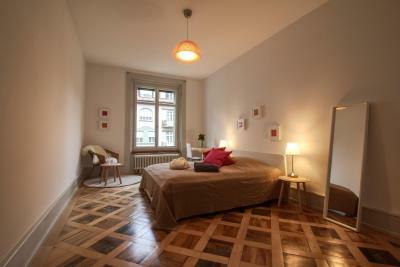 The location is close to train station and bus/tram stops, the area is safe and convenient. 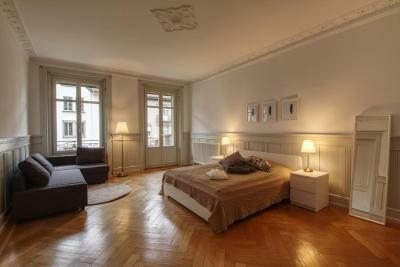 The room is spacious, it's exactly like in the pictures. I love this room, it feels homey. The bath/shower rooms are clean and huge, it's a shared but I found no problem at all. Breakfast is great, and the dining room is very nice, you get to meet other travellers during breakfast. And I'd like to highlight its best host ever, Angela and Patrick are truly showing Swiss hospitality. I really had wonderful stay here. Thank you! Lovely little "B&B" in an apartment on a quiet residential street. The location is convenient to the train station and the Old City, but it's far enough removed from the tourist hustle and bustle that you can really feel like a local. Free tea and coffee are available all day in the breakfast room. The rooms are huge and easy to relax in. Ask for room 103 (or maybe one other? ), which has a balcony overlooking the street. The hosts are extremely friendly and helpful, always with big smiles. I like the free muffins and fruits, and the breakfast was awesome too! Really felt like home. The host was wonderful - easily accessible, very friendly. The place is beautiful and an easy walk from everywhere in Bern. The breakfast spread was amazing! Delicious local goods, and great company. Only a short stay, arrived late, but the instructions for self check-in were clear and easy. 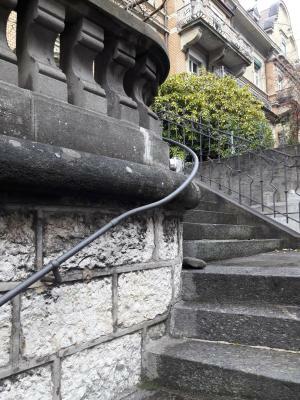 The house is very clean and tidy, conveniently located in central Bern, only a short walk from the railway station and city centre. The facilities were exactly as described with a bonus of a public transport ticket provided for further exploring the city. The breakfast was extremely good and the host very friendly! 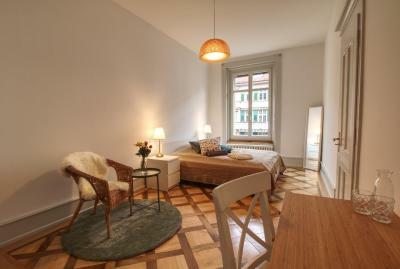 B&B Gutenberg provides accommodations in Bern near House of Parliament Bern and Bern Clock Tower. The property is around 0.8 mi from Münster Cathedral and 1.2 mi from Bärengraben. The property is 1.9 mi from BEA Bern Expo and 2 mi from Stade de Suisse. The rooms will provide guests with a desk. 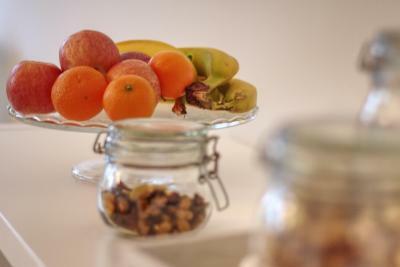 Guests at B&B Gutenberg can enjoy a continental breakfast. Einsteinhaus is 0.7 mi from the accommodations. 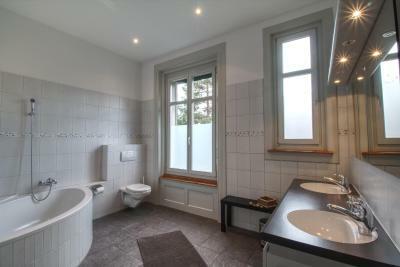 The nearest airport is Bern-Belp Airport, 3.7 mi from the property. Mattenhof-Weissenbühl is a great choice for travelers interested in history, museums and architecture. 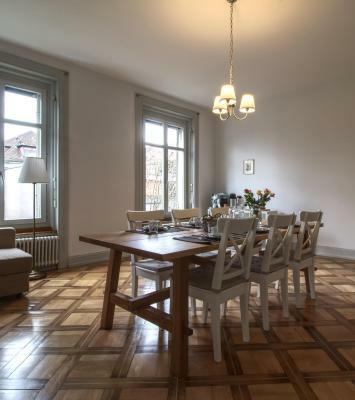 This property also has one of the top-rated locations in Bern! Guests are happier about it compared to other properties in the area. 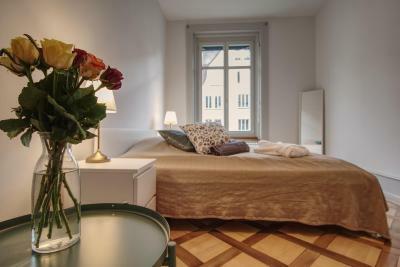 When would you like to stay at B&B Gutenberg? This double room with shared bathroom has bathrobes. Area Info – This neighborhood is a great choice for travelers interested in history, museums and architecture – Check location Excellent location – show map Guests loved walking around the neighborhood! House Rules B&B Gutenberg takes special requests – add in the next step! 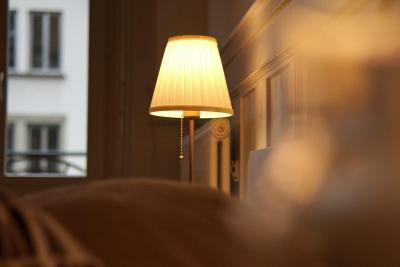 Any additional older children or adults are charged CHF 95 per night for extra beds. B&amp;B Gutenberg accepts these cards and reserves the right to temporarily hold an amount prior to arrival. B&B Gutenberg accepts these cards and reserves the right to temporarily hold an amount prior to arrival. The hosts were very friendly and helpful. Great location near the train station. That I could not stay any longer!!! 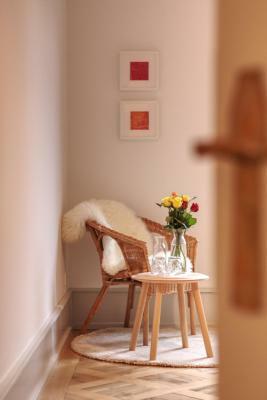 A sense of refined simplicity, verging on minimalism, in a peaceful environment. The room is made in a way that you loose hope. Old, cheap without any amenities. The sink, bathroom and toilet are outside. It is truly depressing and isolated. You cannot have any activity or shower from 10:00 PM to 06:00 AM. The offer in the website is misleading. The gate, door, to upstairs.. no lights at all. If its automatic, it should turn on but I could not find the light switch although there was insruction, could not follow easily. Also wish TV was there to catch up on the news. Very large and clean bathroom and bedroom. Breakfast was wonderful, great! Location is somewhat close by where we wanted to go. Off the city central but still can access to major touristy places. Angelena is very lovely and friendly. very welcoming. the place is so cosy and homey, its very nice and relaxing. the breakfast is just amazing, very yummy with vadiety of options. 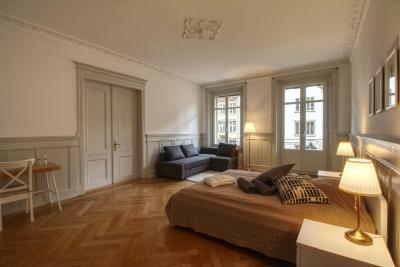 Big room and clean, good wifi, in the centre of Bern, the owner Angela & Lukas are very nice! The only little thing is that all rooms are on the same floor and that some people are very loud. I think that there should maybe be a sign remaining not to forget that there is some people still sleeping. Also close the door from the breakfast room. I wish we'd been able to stay another night before leaving town. Shared bathrooms (and busy), breakfast only until 10, thin walls, i.e. you hear every time someons else opens a door or goes to the bathroom. A little vegetables at breakfast would be nice. 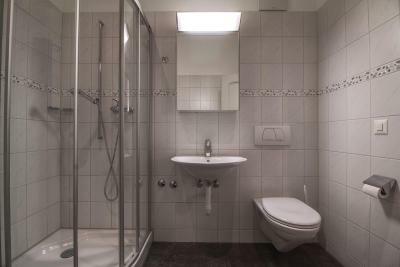 The showers and toilets are very clean and spacious but are shared by all guests as clearly indicated. Highly recommended!! A 10 minute walk from the Old City and even a little less to the train station. Very pleasant place in an old building with character. The room was spacious, clean and very cozy. 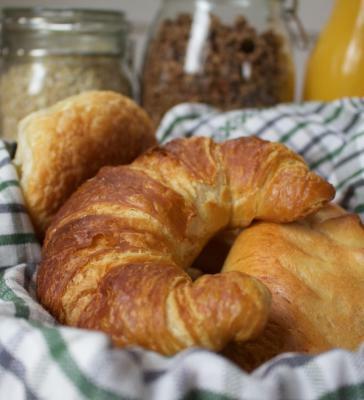 A delicious breakfast at a large table that is shared with the other guests, so it's fun to meet and chat. You can drink free coffee and tea 24 hours a day. The bathrooms and showers are clean and spacious. But above all - The human warmth and the desire to improve the stay and help from the team is what adds to the most points. 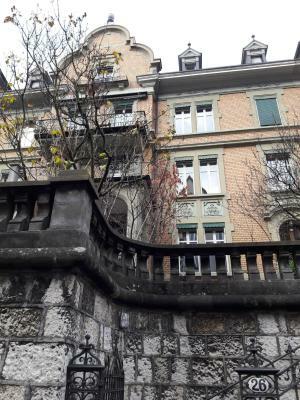 I would definitely be happy to stay in this place again if I went back to Bern.